As we head towards either the completely unforced self-immolation of default, or the almost as self-defeating response of belt tightening amidst a recession, it’s worth taking yet one more swing at the piñata: does the US have a debt/deficit crisis? Here’s Kthug, debunking yet again the myth of out-of-control federal spending. DeLong reminds us (yet again)that the bond market thinks our debt is nothing to write home about. Karl Smith reminds us that the US is borrowing money at a rate that amounts to a negative real return — which is to say that right now it is cheaper for the US to borrow than to pay cash for what it buys. …what matters about the debt isn’t the dollar amount per se, but how much it costs us to service it. And by that measure, the debt isn’t nearly as big a problem as it’s being made out to be. Yes, the federal debt has grown by nearly $3 trillion dollars in the past three years. And yes, the dollar amount of that debt is quite large (in excess of $14 trillion and headed toward $15 trillion should the ceiling be raised). But large numbers are not the problem. The U.S. has a large economy (slightly larger than that debt number). And, crucially, we have very low interest rates. Because of those low rates, the amount the U.S. government pays to service its debt is, relative to the size of the economy, less than it was paying throughout the boom years of the 1980s and 1990s and for most of the last decade. The Congressional Budget Office estimates that net interest on the debt (which is what the government pays to service it) would be $225 billion for fiscal year 2011. The latest figures put that a bit higher, so let’s call it $250 billion. That’s about 1.6% of American output, which is lower than at any point since the 1970s – except for 2003 through 2005, when it was closer to 1.4%. Under Ronald Reagan, the first George Bush, and Bill Clinton, payments on federal debt often got above 3% of GDP. Under Bush the second, payments were about where they are now. Yet suddenly, we are in a near collective hysteria. Yup…for a debt burden that in budgetary terms is about half of what Saint Ronnie dealt with, we are now contemplating dismantling the safety net and gutting the investment in education, research and infrastructure that are essential for any future economic security for our country and our kids. The good news is that this comes from an unequivocally MSM source. The bad news is that the Village, for the most part, has failed to convey to the American people that what we are seeing is simply the smokescreen the GOP is using to hide its pursuit of policies that it could never sustain in the full light of day. Too much of our government has fallen into the hands of fools and knaves. And the press — not enough of it, even now — has left it way too late to confront that fact. And yes, as Karabell and the others have noted, the Democrats have either gone along with too much of this nonsense, or else mounted ineffective opposition to the folly, avarice and/or pure stupidity of their opponents. But consider the alternative — and, it seems to me, we gotta work, however resentfully, as hard as it takes to hold what we have and to grab the House back fifteen months from now. “Not that bad” may be cold comfort…but your modern GOP is terrifyingly worse. 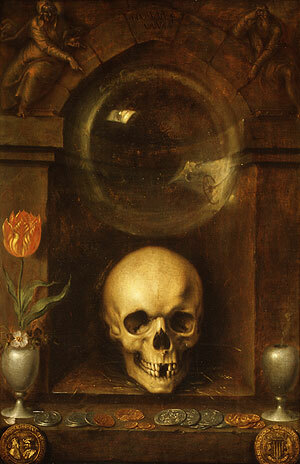 Image: Jacques de Gheyn (II), Vanitas Still Life, 1603.